Annie's Gardening Corner: What’s Your Holiday Tradition? During this magical season, many families partake in holiday traditions; be it a special day to light the Christmas tree to the holiday dinner. Maybe it's a certain cookie or pie; an old family recipe that only surfaces during this time of year. So what’s your holiday tradition? My family added an interesting one a few years back - the dessert bake-off to accompany the Christmas day feast. Each year we pick a different type of dessert (the reigning winner determines this at Thanksgiving.) There are usually about ten or so brave entries and the rest automatically become judges; this includes children with discerning sweet buds and spouses and parents voting with yes, only an unbiased opinion. It is definitely YMCA rules although on occasion, like this year, there’s a disqualifying factor – if you don’t have your recipe printed to the dessert, well, who knows. There have been some sketchy entries on whether it was from scratch or not. Remember, YMCA rules do apply. What matters most is that coveted prize at stake - the winning title. There is even a small trinket for capturing last place but that winning title is worth gold. The first bake-off set the tone. The chosen sweet - fudge. You can only imagine that there were some real losers in this one. My brother took that first title with his concoction, which resembled frosting. Due to such razing, he actually forfeited his treasured prize to the fudge landing in last place, which truly was an abomination. Yes, there were quite a few vying for the low end of the totem pole. So every year since, my poor brother can’t shake his tarnished title. That fudge story comes alive with everyone vying to beat my brother’s frosting. Oh, excuse me – fudge. So this year the dessert on deck - cookie bars, which according to my brother who has fervently been researching his recipes said has quite a history. I’m hoping that if you don’t share one of your holiday traditions you might lead me in the direction of a smashing cookie bar recipe. So I'll wrap it up with a Peg Bracken quote, “Gifts of time and love are surely the basic ingredients of a truly merry Christmas.” But you can't forget the winning bake-off recipe! 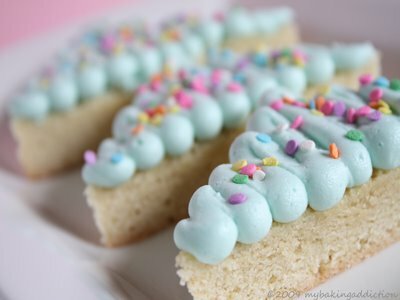 Image from http://www.mybakingaddiction.com/sugar-cookie-bars/ with what just might be this year’s winning recipe! Plenty of frosting on this one.